The 3000 metres or 3000-metre run is a track running event, also commonly known as the 3K or 3K run, where 7.5 laps are completed around an outdoor 400 m track or 15 laps around a 200 m indoor track. It is debated whether the 3000m should be classified as a middle distance or long distance event. In elite level competition, 3000 m pace is more comparable to the pace found in the longer 5000 metres event, rather than mile pace. The world record performance for 3000 m equates to a pace of 58.76 seconds per 400 m, which is closer to the 60.58 seconds for 5000 m than the 55.46 seconds for the mile. However, the 3000 m does require some anaerobic conditioning and an elite athlete needs to develop a high tolerance to lactic acid, as does the mile runner. Thus, the 3000 m demands a balance of aerobic endurance needed for the 5000 m and lactic acid tolerance needed for the Mile. In men's athletics, 3000 metres has been an Olympic discipline only as a team race at the 1912, 1920 and 1924 Summer Olympics. It has not been contested at any of the IAAF outdoor championships, but is occasionally hosted at annual elite track and field meetings. It is often featured in indoor track and field programmes and is the longest distance event present at the IAAF World Indoor Championships. In women's athletics, 3000 metres was a standard event in the Olympic Games (1984 to 1992) and World Championships (1980 to 1993). The event was discontinued at World Championship and Olympic level after the 1993 World Championships in Athletics – Qu Yunxia being the final gold medal winner at the event. Starting with the 1995 World Championships in Athletics and the 1996 Olympic Games, it was replaced by 5000 metres, with other IAAF-organized championships following suit. Skilled runners in this event reach speeds near vVO2max, for which the oxygen requirements of the body cannot continuously be satisfied, requiring some anaerobic effort. The men's world record is 7:20.67 set by Daniel Komen of Kenya in 1996. Komen also holds the world indoor mark with 7:24.90 minutes set in 1998. The women's world record is 8:06.11 set by Wang Junxia of China in 1993. 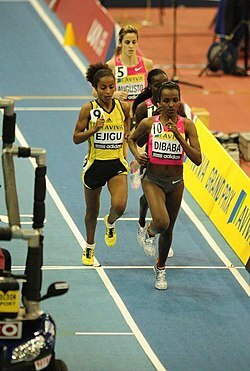 The world indoor women's record is 8:16.60 minutes, set by Ethiopian Genzebe Dibaba in 2014. Daniel Komen also ran 7:25.16 (1996), 7:25.87 (1996). Haile Gebrselassie also ran 7:25.54 (1998), 7:26.02 (1997), 7:26.03 (1999). Kenenisa Bekele also ran 7:26.69 (2007). Wang Junxia also ran 8:12.19 (1993). Qu Yunxia also ran 8:12.27 (1993). Zhang Linli also ran 8:22.06 (1993). Almaz Ayana also ran 8:22.34 (2015), 8:23.11 (2016). Hellen Obiri also ran 8:23.14 (2017). Genzebe Dibaba 8:16.60, 8:22.50 and 8:24.85; Meseret Defar 8:23.72 and 8:24.46, Meselech Melkamu 8:23.74, Sentayehu Ejigu 8:25.27 and Laura Muir 8:26.41 have run faster than listed above indoors. The shorter indoor tracks would be disadvantageous, but because the indoor tracks are banked, they do not meet the specifications to qualify as equitable marks. Genzebe Dibaba also ran 8:22.50 (2016), 8:24.85+ (2014), 8:26.95 (2013). Meseret Defar also ran 8:24.46 (2010), 8:26.99 (2009), 8:27.93 (2008). Meselech Melkamu also ran 8:29.48 (2008). Hellen Obiri also ran 8:29.46 (2017), 8:29.99 (2014). ^ Middle-distance running. Encyclopædia Britannica. Retrieved on 2014-06-02. ^ Women's 3000 metres at the Olympic Games. Sport Reference. Retrieved on 2014-01-18. ^ World Championships in Athletics. GBR Athletics. Retrieved on 2014-01-18. ^ Billat, Véronique L.; J. Pierre Koralsztein (August 1996). "Significance of the Velocity at VO2max and Time to Exhaustion at this Velocity" (PDF). Sports Med. 2: 90–108. Archived from the original (PDF) on 21 March 2012. Retrieved 27 March 2011. ^ "All-time men's best 3000m". alltime-athletics.com. 18 July 2017. Retrieved 21 July 2017. ^ "3000m Results". SF. 18 August 2018. Retrieved 21 August 2018. ^ "3000m Results" (PDF). sportresult.com. 5 May 2017. Retrieved 5 May 2017. ^ "All-time women's best 3000m". alltime-athletics.com. 18 July 2017. Retrieved 21 July 2017. ^ "3000m Results". IAAF. 14 June 2015. Retrieved 14 June 2015. ^ "All-time men's best 3000m indoor". IAAF. 21 July 2017. Retrieved 21 July 2017. ^ "All-time women's best 3000m indoor". IAAF. 21 July 2017. Retrieved 21 July 2017. ^ "Laura Muir smashes European 3000m record in Karlsruhe". athleticsweekly.com. 4 February 2017. Retrieved 4 February 2017. ^ "3000m Results" (PDF). British Athletics. 18 February 2017. Archived from the original (PDF) on 15 March 2017. Retrieved 18 February 2017. ^ Bob Ramsak (17 February 2019). "Indoor round-up: Ndama tallies 4672 pentathlon world lead in Miramas, world leads for Klosterhalfen and Schwanitz in Leipzig". IAAF. Retrieved 22 February 2019. ^ John Mulkeen (5 February 2018). "Taplin and Oduduru climb world all-time sprint lists – indoor round-up". IAAF. Retrieved 5 February 2018.